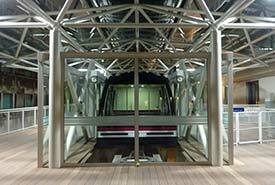 ABOVE: A Venice People Mover train in the Piazzale Roma station. INSET BELOW: A station wall mural and entrance sign. The Piazzale Roma, where locals and visitors arrive in the city by public bus, airport bus, taxi, or car. The Tronchetto parking island, which has indoor and outdoor parking for thousands of cars and is also the arrival point for most tour buses. The People Mover is a cable-operated tram system that's similar to the automated shuttles in many large airports. In this article, we'll tell you how to use the People Mover, and we'll show you captioned photos and videos so you'll know what to expect.